Willy Messerschmitt's Bf 109 was the Luftwaffe's benchmark fighter throughout World War II. It was the mount of the vast majority of the German aces and scored more kills than any other Axis aircraft. Few fighters of the period bettered the Bf 109's longevity, either. The aircraft entered service in time to be blooded in Spain, and it remained the backbone of the Luftwaffe fighter arm until the end of the war. Even after 1945 it continued to serve with several air forces and briefly went back to war in Israeli hands. The aircraft rapidly gained something of a reputation, which was carefully nurtured by Nazi Germany's expert propagandists, and this lived on even after the aircraft had begun to show its age, and while newer fighters on both sides were clearly its betters. For its achievements up to 1940 alone, the Bf 109 deserves to go down in history as one of the World's great fighter aircraft, and if the same level of superiority over all opposition eluded the Bf 109 from the Battle of Britain onwards, this should not tarnish the fighter's reputation. Indeed, in the face of a constantly changing air war, the Bf 109 proved adaptable enough to accept new powerplants and weapons with a minimum of modification, allowing the family of variants and sub-variants to grow rapidly, with scarcely a break in production. This versatility was probably the key to the aircraft's colossal success, and was due to straightforward sensible design practice. The birth of the Bf 109 was the outcome of political feuding between Erhard Milch and Willy Messerschmitt, which threatened extinction of the private Bayerische Flugzeugwerke. The company's M-20 monoplane airliner failed spectacularly, the prototype and two production aircraft crashing and Deutsche Luft Hansa canceling all orders. This led the company to the brink of financial ruin, but recovery was made possible when Luft Hansa were forced to take delivery of the aircraft they had ordered. As head of Luft Hansa Milch had accused Messerschmitt of building unsafe aircraft and as Reich Commissioner for aviation, his hostility ensured that the company would only receive small orders to license build aircraft designed by others, and would not be asked to design its own aircraft for the rearmament of the Luftwaffe. This situation finally changed after the company negotiated to supply a Romanian cartel with a new transport aircraft in 1933. Infuriated by Messerschmitt's touting for overseas business, officials at the Reichsluftfahrtministerium (RLM, or State Ministry of Aviation) drew from Messerschmitt the retort that he had been obliged to seek business elsewhere because of the lack of support from Berlin itself. Stung by this accusation, the RLM awarded a contract which resulted in the highly successful Bf 108 Taifun, and soon afterwards awarded fighter development contracts to Arado, BFW, Focke-Wulf and Heinkel, it being confidently expected that Messerschmitt's lack of experience in high-speed aircraft design would mean that his contender would stand little chance of success. Employing features of his excellent Bf 108 Taifun four-seat tourer, Messerschmitt's design emerged as a small angular low-wing cantilever monoplane with retractable landing gear, leading-edge slats and enclosed cockpit. These features, together with its all-metal, flush riveted monocoque fuselage, made it the most modern of the contenders, since the Heinkel had an open cockpit and no slats, the Arado an open cockpit and fixed landing gear, and the Focke-Wulf a braced, unslatted high wing. Such modernity was striking, and rather controversial, drawing from Ernst Udet the comment that the aircraft would 'never make a fighter'. It had been intended to use the new Junkers Jumo 210A engine, but this was not available for the Bf 109 V1 prototype so an imported Rolls-Royce Kestrel V of 695 hp (518 kW) was used, the aircraft being rolled out and flown in September 1935. Though no one was to know it at the time, this choice of powerplant would be echoed years later, when the last Bf 109 variant, the Spanish 1109-M1L Buchon (Pigeon), used another Rolls-Royce engine, this time the Merlin in 1953. When flown in competition with the Ar 80 V1, Fw 159 V1 and He 112 V1, at the Travemunde trials, the Bf 109 V1 performed well despite minor problems and, amid general surprise, was rewarded by a contract for 10 prototype development aircraft (although it was not in fact declared the outright winner, 10 Heinkel aircraft also being ordered). One problem experienced by the Bf 109 was the collapse of its narrow track landing gear on arrival at the Rechlin test centre. At the time, most put it down to bad luck, but the incident foreshadowed what was to be one of the aircraft's greatest weaknesses throughout its life, unforgiving ground handling characteristics that were to cause the loss or damage of hundreds of production aircraft. Definitive evaluation trials were held at Travemunde in November 1935, and these resulted in final victory over the Heinkel He 112. Superior performance, a spectacular display by Dr Ing Herman Wurster and a lower manufacturing cost settled the issue and the Bf 109 was selected for production. 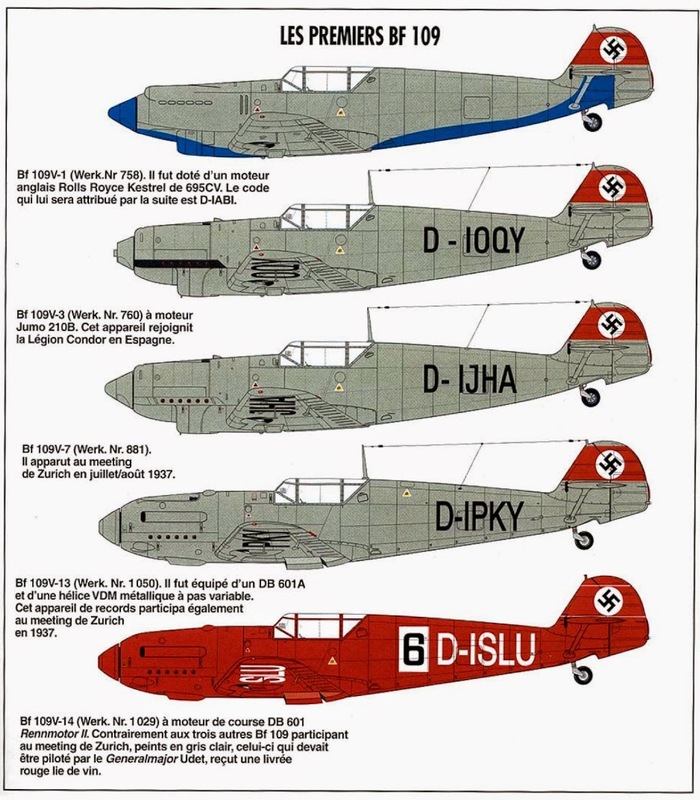 Three further prototypes (the Bf 109 V2 registered D-IUDE, Bf 109 V3 D-IHNY and Bf 109 V4 D-IOQY) were flown in 1936, powered by Jumo 210A engines and with provision for two synchronized 7.92 mm (0.31 in) MG 17 machine-guns in the nose decking. However, rumours abounded that the British Hawker Hurricane and Supermarine Spitfire were to be armed with four guns, so that by the time the Bf 109 V4 prototype flew a third 7.92 mm (0.31 in) MG 17 was planned to fire through the propeller hub. 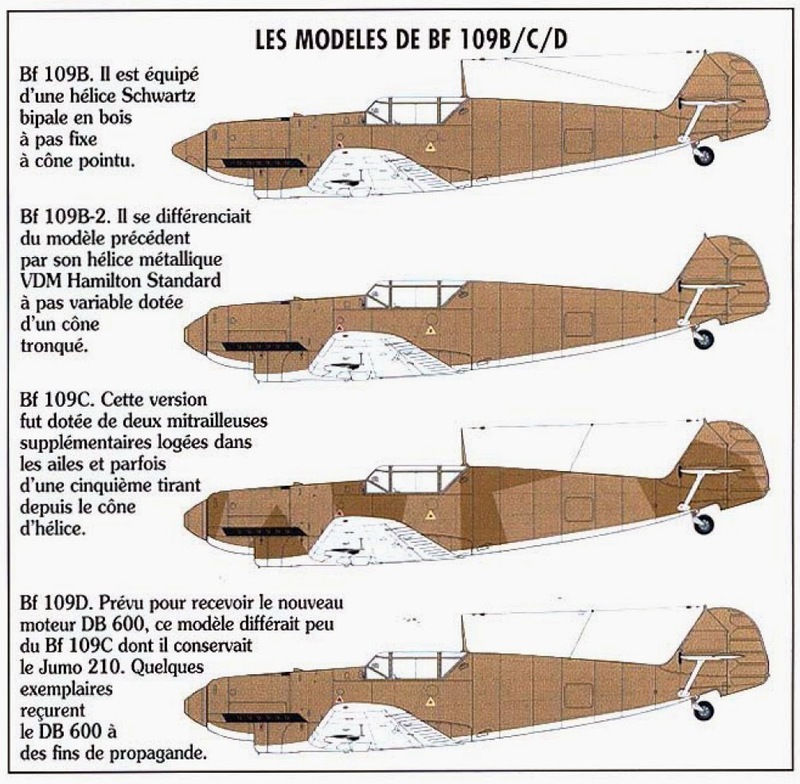 The proposed two-gun Bf 109A production version did not therefore materialize, and the first pre-production Bf 109B-0 examples were flown early in 1937, at the same time as the Bf 109 V5, Bf 109 V6 and Bf 109 V7 prototypes. Considerable operational experience was gained during the Spanish Civil War by three Staffeln of Jagdgruppe 88, fighter component of the 'volunteer' Legion Condor, which received the V3, V4 and V5 for combat evaluation, and which was equipped with production examples of the Bf 109B-1, Bf 109B-2 and Bf 109C-1 versions as soon as they became available, having complained that its initial equipment of Heinkel He 51s simply could not cope against the Republicans' Polikarpov I-16s. This experience assisted in the development of the aircraft itself and in the development of air combat tactics in general, for it was largely through men such as Werner Molders and Adolf Galland who fought in Spain with the Bf 109, that basic air fighting tactics were evolved which were to last well into the jet age. The next prototype, the Bf 109 V9, had two 20 mm MG FF cannons installed in the wings. This machine served as prototype for the production Bf 109 C series which were essentially similar to the BF 109 B series apart from their armament. The pre-production Bf 109C-0 and the initial production Bf 109C-1 both carried four 7.95 mm (0.31 in) MG 17 machine guns, and the Bf 109C-2 subtype had a further MG 17 firing through the airscrew hub. The experimental Bf 109C-4 had four MG 17 guns and a single 20 mm MG FF cannon, but this version was not placed in service. In August 1938 twelve Bf 109C-2 fighters arrived in Spain to re-equip other parts of Legion Condor. While work was progressing on the improvement of the fighter's armament, parallel experiments were being conducted with a view to improving performance. An early 960 hp (705 kW) Daimler-Benz DB 600 engine was installed in a standard Bf 109 B series airframe to form the Bf 109 V10. Two further prototypes, the Bf 109 V11 and Bf 109 V12, were fitted with the production type Daimler-Benz DB 600A, resulting in a substantial improvement in performance, a maximum speed of 323 mph (520 km/h) was attained and the service ceiling boosted to 31,170 ft (9500 m). With this engine a new sub-type, the Bf 109D, entered production in late 1937, the pre-production Bf 109D fighters employing converted Bf 109 B model airframes and carried an MG 17 machine gun in each wing as first introduced on the Bf 109C. In addition, a single engine-mounted MG FF cannon was carried. A small production batch of Bf 109D-1 fighters followed to equip one Gruppe, but the availability of the redesigned DB 601 1,050 hp (783 kW) engine, incorporating direct fuel injection and improved supercharging capacity, had led to abandonment of further production of the DB 600 and, in consequence, the Bf 109D in favour of the Bf 109E with the later engine, and ten of the Bf 109Ds were sold to Switzerland and three to Hungary.